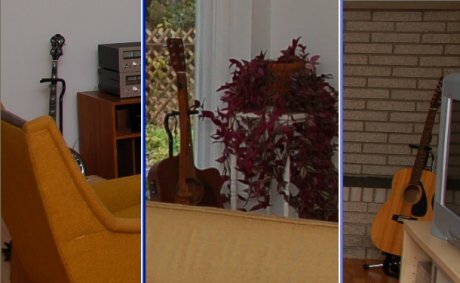 There is a rocker in Rebecca’s 1961 split level house. Not the grampa on the porch kind. The guitar in the living room…and dining room…and family room kind. Which leads me to the #1 rule of displaying your collections: Bring them together. “Mass them,” it’s called. To be sure, these guitars look lovely — architectural — in their present locations. And maybe you’ll want to keep them that way. But collections of objects often make a bigger, even more beautiful statement when you display them together. Oh, and once you have three of anything — you have a collection. If you’re interested in making the guitar collection a focal point, Rebecca, a first thought is to bring them all down to the media room, and to try to do something with them along the fireplace. But — they may be too tall to display on that lower ledge . You don’t want them to feel all squeezed in. Even so, it’s worth playing around with. Also, it’s interesting to see how you and Keith have chosen a color palette harmonious with the guitars. Clearly – someone loves them. Keep working with that palette. It gives you a direction. 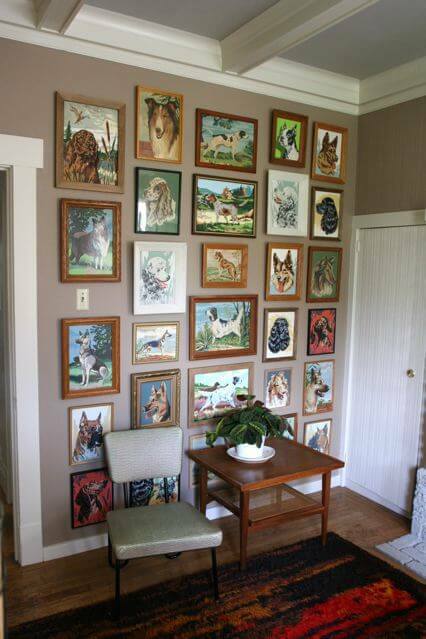 Another example of massing collections: Troy’s paint by number dogs, in this story about mid-century houseplants. Oh! Another story about mid-century houseplants, which I forgot about. There you go. Troy — are you reading? How are you doing with your new house? Troy has exciting news — and a big, new project that he promises to share with us when it is ready for prime time. Troyland.com. In looking at the Bewitched pictures, I have to ask – how many chimneys did they have? They have a fireplace in the living room, kitchen, bedroom and den…That house was one big chimney!! Gavin, ya, I see what you mean, that’s my problem though, I love the more sophisticated looks of the first couple styles but can’t help love the sears and roebuck look of a “everyday” house too, lol. I tend to like a little of everything and mash it all together, hehe. This blog is about lovin’ it all. A great big mashup, to be sure. There’s a rocker in my house too. He’s a total gear head. This means guitars. Lots of guitars. Even more guitars. Guitar stands. Guitar cases. Imagine guitar mushrooms popping up all over your house. Arggh. Desperation -not design- inspired our wall of hanging guitars. It’s a big hit with guests. Their compliments are always heartwarming. More important, however, is the peace that wall provides. Ahhhhhhhh….